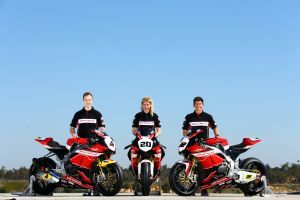 Honda Racing's British Superbike team today unveiled its new race livery for the 2015 season, as the Louth-based operation prepares to return to the series with a strong three-rider line up of Dan Linfoot, Jenny Tinmouth and Jason O'Halloran. Unveiled during a private four-day test at Monteblanco Circuit in Spain, the livery was rolled out on each of the riders' bikes. The three Fireblades all have different front mudguards with each of the riders logos incorporated into the design, as well as an individual tank that features the riders name and their team members. The test proved positive for Honda Racing, which saw Linfoot and O'Halloran return to the circuit after an initial test in January and for Tinmouth, it was her first time aboard the Honda CBR1000RR Fireblade. Each of the riders progressed during the test - working on different set-ups and improved each day on their lap times. "It's great to finally be able to show the new livery after keeping it under wraps for so long. We feel the new design works well and will really stand out on the grid. The riders were happy with their logos incorporated into the design and we're excited to see them in action at the first round of the championship. From a test perspective we're really pleased with how the last few days have gone. Dan and Jason have really progressed from the test we had here in January and it's been great to see Jenny get out on the bike and really get to grips with it, and put in some impressive times." Honda Racing will be on track again on 26 March at Donington Park for the official MCE British Superbike test before the first round of the championship at Donington over the Easter Bank Holiday weekend 4-6 April. For all the latest news on the team follow @HondaRacingBSB on Twitter.